If you’re shopping around for the best Tempurpedic pillow, then congrats! You have the budget and the taste for the King of luxury pillows. These pillows come with a high price tag and to help you avoid buyer’s regret, we’re sharing with you our favorite pillows from this well-known brand. 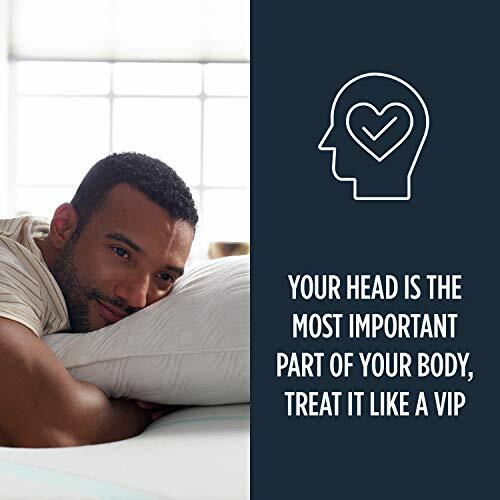 A TempurPedic pillow offers contoured support for your head, neck, shoulders and upper back, however you sleep – on your stomach, your back, or your side. 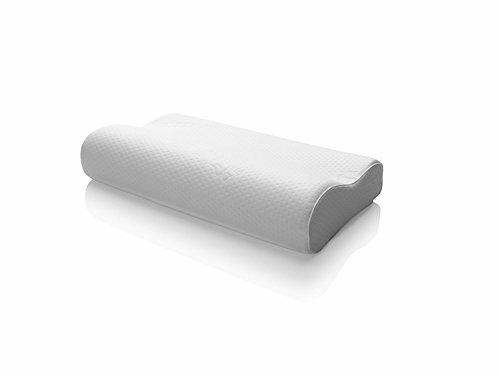 The TempurPedic pillow moulds to your body, providing firm, flexible, comfortable support. There are a handful of ways to properly deal with neck pain but having at least one TempurPedic pillow is ideal for those who suffer from back or neck pain when sleeping. It should be your first purchase if you start to find yourself waking with aches and pains as it could save you the cost of a new mattress. TempurPedic pillows are the top-of-the-line expression of memory foam pillows, but designed and crafted to give superior, all-round comfort. This pillow does sit quite high, which some people may find uncomfortable, but it offers good neck support, and a restful, pain-free night’s sleep. Specifically designed to focus support on the neck, rather than the shoulders or upper back, it is worth bearing in mind the localised support design when considering your purchase: if your problem is more in your shoulders, another TempurPedic pillow may be better suited to your needs. Like almost all memory foam and similar pillows, the TempurPedic neck pillow does have a strong chemical smell, but this should disperse with airing. If neck pain is your biggest sleeping issue, then this is a good pillow to purchase. If you are looking for a TempurPedic pillow to ease back or shoulder pain, however, this option will not be suitable. A queen size pillow from TempurPedic, this is a very heavy pillow, which is too soft to provide effect relief for neck pain, but may benefit those with back and/or shoulder issues. As with most memory foam and TempurPedic pillows, it does have a noticeable chemical smell, although this should fade with time and use. Overall, this is a very comfortable pillow, and would be equally suitable for general chilling as for supportive, pain-easing sleep. If comfort is your primary focus, then this could be the pillow for you. Bear in mind, however, that it will NOT be suitable for those experiencing neck pain, as it does not offer the required support. 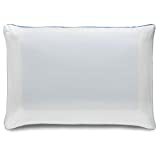 This is a dual-function pillow, that both provides effect back support, and offers a cooling night’s sleep. 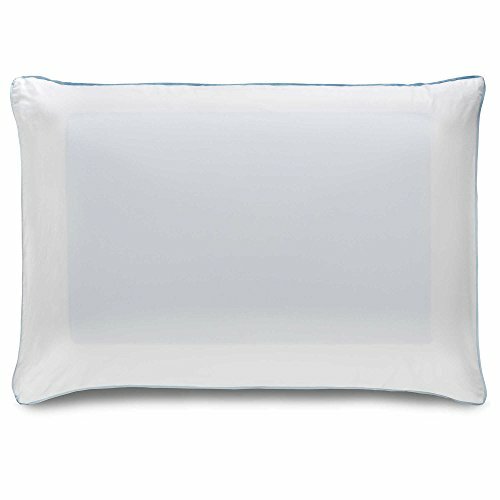 A heavy, firm pillow, this is an excellent investment to ensure you have a comfortable night’s sleep even when summer is at its peak, and getting cool enough is a real struggle. If you suffer from back ache, this pillow is also for you – and if you struggle to get a good night’s sleep because you have back ache and get too hot, then this pillow is exactly what you’ve been looking for! This is a pricey pillow, but definitely a good investment for those who are plagued by back ache and bedrooms that hold way too much heat. If a good night’s sleep is important to you, then it’s worth considering the Cloud Breeze from TempurPedic. TEMPUR-Breeze Gel Layer on both sides. Returns to its formed shape after each use. The support and conforming comfort that only TEMPUR material delivers. This pillow is ideal for those on the shorter side, and offers excellent neck support. It is a comfortable pillow, although, as with all pillows of this type, it does have a lingering chemical smell, which should disperse over time. If you’ve struggled to find a pillow that’s comfortable and supportive because of your shorter stature, then the Low Profile Neck Pillow is for you. Other than the ubiquitous chemical smell that attaches to almost all pillows of this type, there’s not much to not like, and that includes the price. 5 YEAR LIMITED WARRANTY - Adaptive TEMPUR material offers personalized support and alignment and returns to its formed shape after each use. Ideal for those who sleep on their side or back, and for those who suffer with neck pain, the Symphony is a double sided TempurPedic pillow. One side is sloped, the other is flat; this ensures that almost everyone, whatever their sleeping position or comfort issues, can benefit from this pillow. It is a very firm pillow, which may put some people off. This is a flexible, all-round pillow that would benefit almost anyone. Definitely a worthwhile purchase. Are Memory Foam Pillows Good?